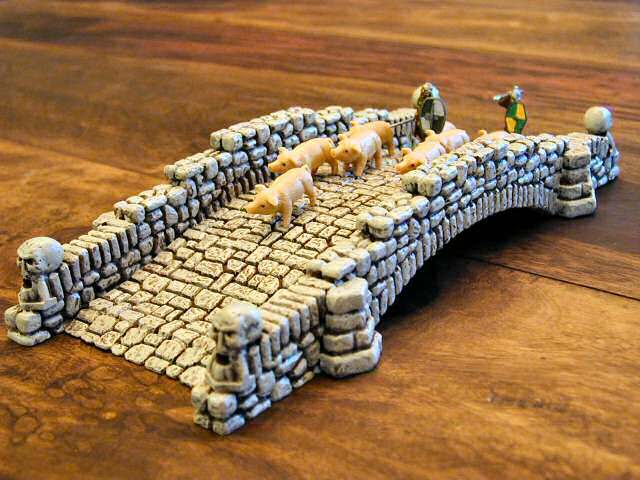 Here are a few words about the design and construction of five unique bridges for 25mm (1/64th) scale miniature gaming using plaster blocks cast from one Hirst Arts silicone mold (#74), the Fieldstone Bridge Mold. The photo at right shows all five bridges. Two bridge pathways are about 5 feet (1.5m) wide, two are about 10 feet (3m) wide, and the largest is about 15 feet (4.5m) wide. Of course these are scale widths, in reality the paths are 1 to 3 inches (25mm to 75mm) wide. 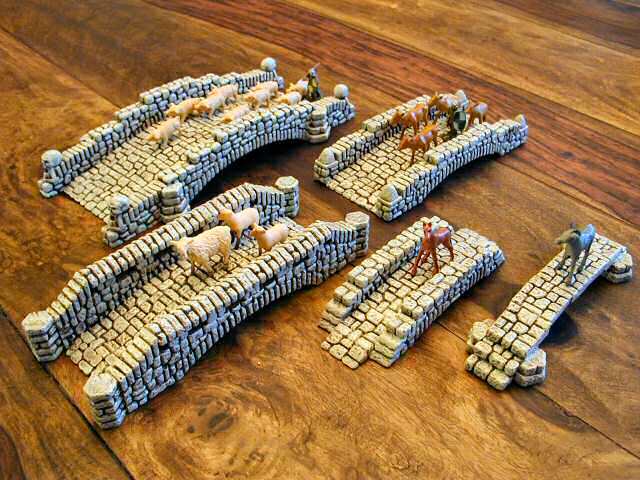 The bridges are made from dental plaster blocks cast in silicone molds. The mold provides various shapes and the modeller casts as many sets of bricks as are necessary to make a model, kind of like a do-it-yourself Lego™ block set. The bridges are painted with latex paints and sealed with a durable matte acrylic finish. I used the standard paint scheme given on the Hirst Arts site, a dark brown undercoat, a medium red brown middle coat, and a pale yellow highlight coat, which appears nearly white here due to the yellowish incandescent lighting. The 25mm Celtic warrior and the donkey are crossing the footpath bridges in the photo at right. The dude's bridge is a simple elevated path made with three of the arch stones and two stair stones at either end. These are butted by column bases to make it look like firm footings at each end. 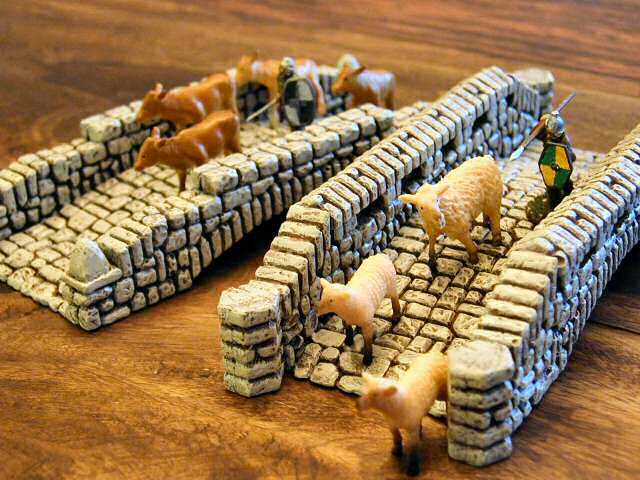 Since the Hirst blocks have "SIDE" imprinted on each block edge, I had to use modeller's putty to hide the words This is the only bridge of the five that won't accept wagon traffic because of the stairs at the ends - foot traffic only. 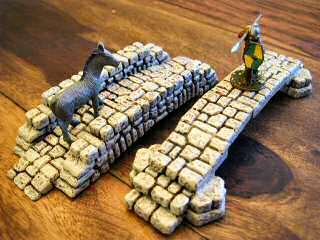 The donkey's bridge is also a single-wide path made with three arch stones, but with some fancy walls on the sides. I don't like the fantasy looks of some of the Hirst blocks, so I kept the decoration to a minimum. This bridge would be at home in any Dark Age to Renaissance setting. The ramps at each end of the path are made by sanding a thin block at an angle. Carts, humans, and donkeys welcome. Here two Celtic warriors are leading their animals across two double-wide bridges. The nearer bridge with the sheep is made with two sets of five arch tiles glued side-by-side. The fancy walls have column pieces at each end, kind of like heavy buttresses holding everything together. The rails are made with column pieces layed flat on top of floor pieces. Again I tried to leave the bridge as simple and devoid of decoration as possible to fit in with my Ancients gaming. The farther bridge with the four calves consists of the same arch span. This one has a slightly different side wall. Here I used the fancy pillar cap on the ends to give it a bit of decoration. The Celtic Warriors in this photo shoot are 25mm "Gauls in Tunics" from Gripping Beast. They are nicely proportioned and a lot less cartoony than Foundry or Old Glory figures. The animals are simple plastic barn animals that you find at better toy stores. 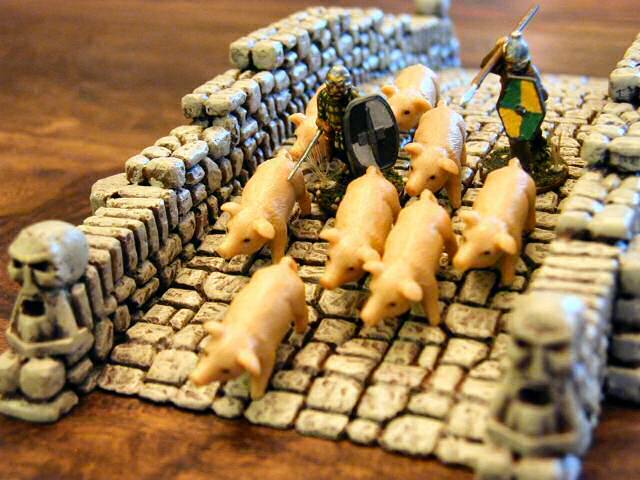 They are larger scale than the humans, but in a miniatures game like "Pig Warriors" you've got to have prize barnyard critters for the spoils. This photo shows the largest triple-wide bridge. The walkway consists of three arches each of eight full arch stones. Ramps are added to allow cart traffic. The side walls consist of a full set of 10 wall arch stones. I really admire the way Bruce Hirst designed the piece of this mold. As you see the walkway arches accomodate anything from a three to an eight arch span. The side walls can handle from 10 down to 2 stones. Despite my earlier rant, here I use the fantasy style screaming head totems on each of the four corners of the bridge. The screaming face is straight from the mold, but I used modelling putty on the back of the head to make it appear more skull like. For those peasants who cannot read, this frightening head screams "danger". Or perhaps it screams "evil spirits keep away." Whatever they scream, it does not prevent these two Celts from driving their pigs to market. To market, to market to buy a fat pig. To market, to market, a jig a jig jig. Here we see the juicy porkers nearly back home. In "Pig Warriors", these dudes have scored an impressive 80 porcine points. If they slaughter a few Vikings and Saxons along the way, that's all the better. Thanks for reading this far. If you like this modelling project, you may also enjoy the gaming towers I have constructed and discussed in other articles: Celtic Round Tower, Round medieval dice tower, Campanile dice tower, Basswood dice tower, and the Laser cut dice tower. Check back to this site for when I add more scenery and miniatures gaming related material. Last modified: Thursday, 09-Jun-2011 12:38:11 MST.